It’s the 3rd of July and lucky for me it’s a sunny Monday morning in Horsham! The time has come for a new step in my life (Work experience) and what better way than spending it with RMV Productions. I arrived at 10am and the boss of RMVP greeted me and showed me around the office – where the world surrenders to the genius minds of the crew. Swiftly after this I met Matthew the studio assistant, who was full of enthusiasm. (I think mostly because for this week he would no longer be the most junior member of staff!) 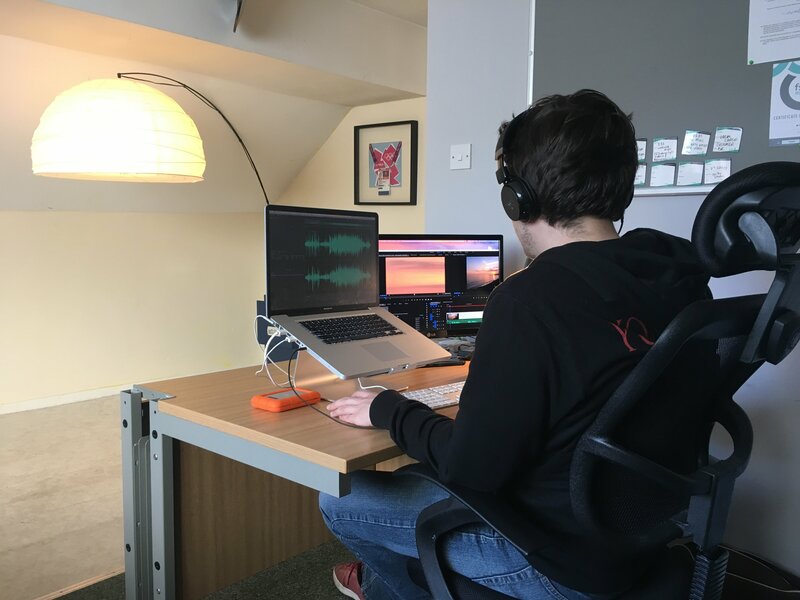 The first task of the day was to clear out a large storage cupboard in order to prepare it for becoming the new audio recording booth, which will shortly be a key aspect in the creative production line at RMVP. After hours of intriguing enjoyment about working for RMV productions, the day came to an end – I have never been more fascinated or enjoyed learning more than I did today. There are so many cheesy lines that could describe my excitement to start another day of work experience, but none of them could truly get close to the leap out the door I made to arrive for my 10 o’clock start at the RMVP offices! With another warm welcome from Peter and what came close to the perfect cup of tea. Once again another media packed day. Firstly we planned our shoot around the brief that we got given by Peter, to create a tourism promo for Horsham aimed at ‘millennials’. This was great practice for me as I’m known for my thoughtful planning in A – level media. At around 12 the highlight of my day arrived… The Blackmagic 4K camera! This was certainly an experience to say the slightest, with its modern touch and 4K definition (Including the ability to change the codex from RAW to ProRes). 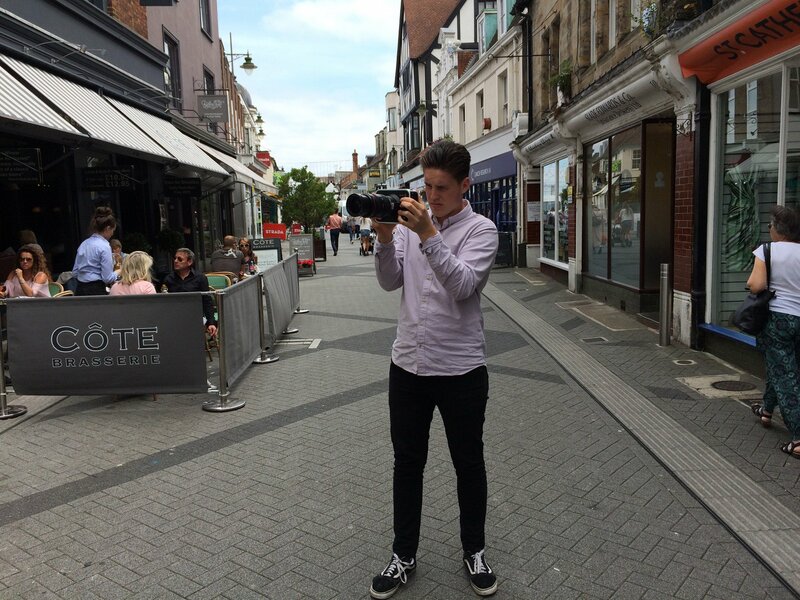 From arrival, we took it around Horsham town and shot some footage which was the definition of interesting, as we winded through the historical streets finding the perfect shot. Another 7am wake up. On this hot British humid morning, I arrived and thank god we have a coo office! As a result this was perfect for the long day of editing ahead. Some may find this dull, but for me it never gets old. While editing with Premiere Pro I learned many new features that will in the future boost my knowledge in editing, as an example Pete taught me how to color grade efficiently – this was important as it boosts the colors in the image to help you achieve an effect. My editing was successful as the product started to look more fined tuned, compared to a bunch of images put together. My favourite part of editing today was certainly using my creativity to create an outstanding show real for RMV productions. After 7 hours of sitting on my leather lined seat and staring at the state of the art RMV technology, what felt like an hour had quickly ended to lead me to the end of the day. The final day of filming has came upon us, with a pleasant overcast sky that would help with subtle lighting for our filming throughout the day. We went to great lengths to get the satisfactory shot that we deserved, one of which was trekking up a long path to Denne Hill to get an overview of Horsham. This was essential as it gave the audience a view of Horsham from a different angle, therefore boosting our narrative of the story. Furthermore we continued to get creative shots around Horsham (park, town, suburbs, outer suburbs) this was also interesting for me as I got to know Horsham better. One of my favourite parts of filming today was using my creativity to get shots that others may of not thought of, furthermore my favourite location to film was at the park, this is because the ducks and swans were there. As a result we used our creativity to get videos which could be used in our short promo. Once finished filming we headed back to the office where we cooled down and started the editing the final promo for Friday! The dreaded final day has arrived this week has zoomed past… yet I have gained so much memories that I will remember for the coming years. While working at RMV Productions I have enjoyed everything from making teas (my generosity) to shooting with 4K cameras. Today I finished editing both my projects which I am extremely proud to say I made “Horsham Promo” and editing the “Show Reel”. This took a lot of time and effort, but the final product is the best edit i’ve ever made, which I am extremely proud of! Hopefully in the future I will be joining Pete and the team again for an internship experience. I’d also like to say a Huge thank you to Matt for giving me company and assisting me filming. Thank you! RMV Productions are committed to nurturing and developing young creative talent in the media industry. 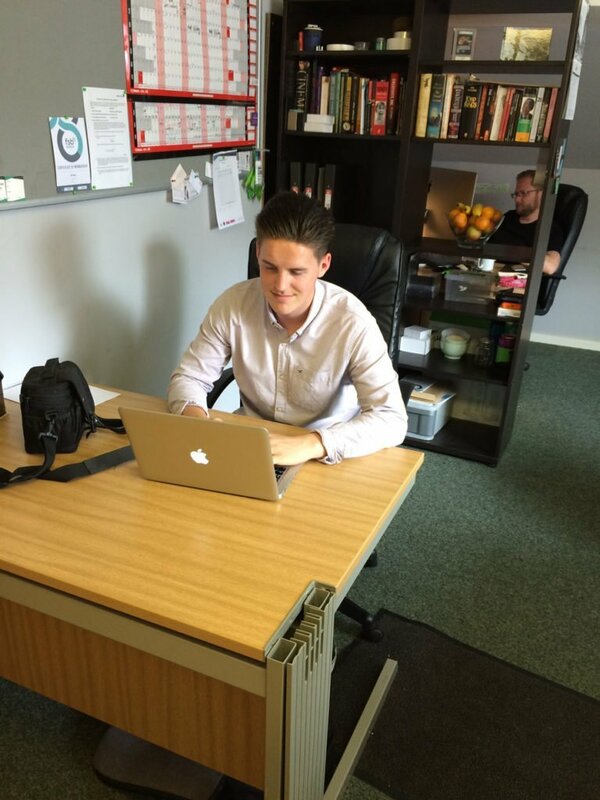 Over the last two years we have taken on 3 interns who have progressed with to employee or freelance staff who we work with regularly. 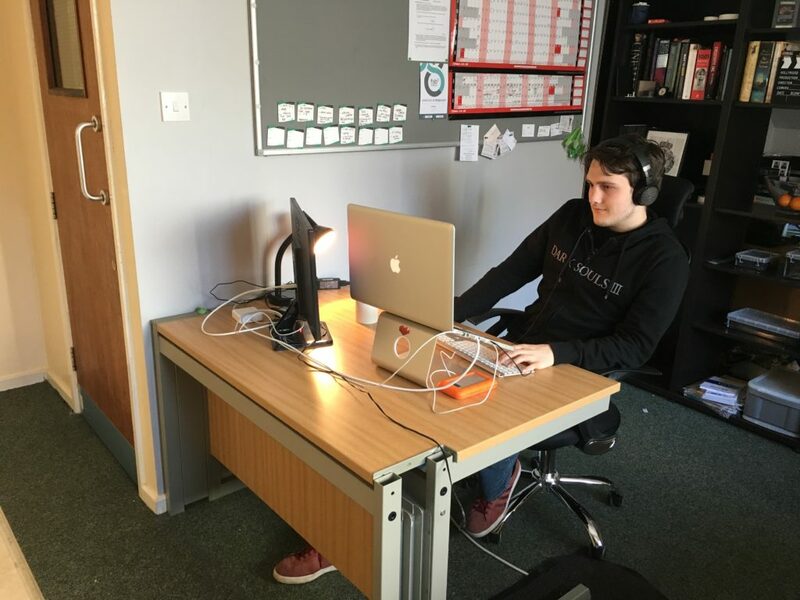 Toby has been our first work experience junior placement and based in the success of the week, his enthusiasm and hard work, we look forward to welcoming future work experience placements. Since I joined RMV as an audio intern about a month ago I have to say it’s been an amazing experience so far. To be able to start my career in this industry surrounded by high-level professionals has been a crazy opportunity.